One of Britain’s foremost glass artists with examples of his work in public collections in the UK and aboard. In 1957 Pennell won a major German scholarship to study gem engraving in Idar Obestein there he developed relationships with engravers and craftsmen which would last all his life. In 1964 both Pennell and his wife left formal teaching and set up a studio in rural Herefordshire. Pennell refrained from exhibiting until 1974 when he was offered a major solo show by the Crafts Council Of Great Britain. 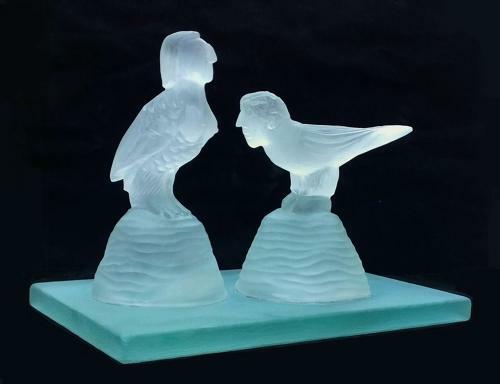 In 1977 he began engraving in glass, this is when he developed his idiosyncratic iconography often infused with humour, men and women pitted against nature along with owls crocodiles and mythical beings. In 1990 he developed his glass sculpture following his professorship at Wolverhampton University. Pennell has exhibited widely since 1974 having many solo shows. His work is public collections throughout the world. The Victoria and Albert, Corning Museum in USA and Toyama Glass Art Museum in Japan, which holds the largest collection of his work.